Here is the answer for people who have asked me and also for people who are looking for an answer to this question online. BA is used to gain insights that help in making informed business decisions and can be used to automate and optimise business processes. Companies that are Data-driven, treat their data as an asset and leverage it for a competitive advantage. Successful business analytics depends on data quality, skilled analysts who understand the technologies and the business, and an organisational commitment to data-driven decision-making. Unfortunately, Business Analytics has become a catch all word for any thing to do with data. So if you are new to this field and don’t understand what people refer to as “Business Analytics”, don’t worry! This is confusing, not just for the person applying for a particular role but also the selectors to understand and and find synergy with what a person has done in past. Now, if I got this as description for one of the jobs I had applied to, I would be scared! Scared, not because I don’t know the subject, but because, these could mean anything. The work could refer to preparing basic reports at a junior level to performing multi-variate deep dives on various subjects. Business analytics techniques break down into two main areas. The first is basic business intelligence. This involves examining historical data to get a sense of how a business department, team or staff member performed over a particular time. This is something that most organisations are fairly accomplished at using. The second area of business analytics involves deeper statistical analysis. This is about using predictive analytics by applying statistical algorithms to historical data to make a prediction about future performance. Or, it could mean using other advanced analytics techniques, like cluster analysis, to group customers based on similarities across several data points. 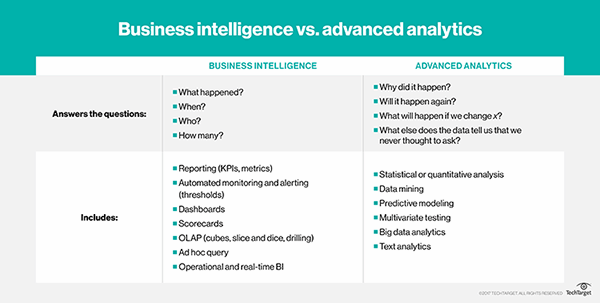 The more advanced areas of business analytics can start to resemble data science, but there is a distinction. Even when advanced statistical algorithms are applied to data sets, it doesn’t necessarily mean data science is involved. There are a host of business analytics tools that can perform these kinds of functions automatically, requiring few of the special skills involved in data science. True data science involves more custom coding and more open-ended questions. Data scientists generally don’t set out to solve a specific question, as most business analysts do. Rather, they will explore data using advanced statistical methods and allow the features in the data to guide their analysis. Business Analytics starts with setting the business goal of the analysis. To achieve it an analysis methodology is selected and data is acquired to support the analysis. Data acquisition often involves extracting data from one or several business systems, cleansing of that data and then integration into a single repository, which is generally a data warehouse or database. The analysis is typically performed against a smaller sample set of data. Analytics tools range from spreadsheets with statistical functions to complex data mining and predictive modelling applications. With every step patterns and relationships in the data are uncovered and basis that new questions are asked. This analytical process iterates until the we reach a point that the answers are good enough to ensure that business goal is met. Deployment of predictive models involves scoring data records — typically in a database– and using the scores to optimise real-time decisions within applications and business processes. BA also supports tactical decision-making in response to unforeseen events. And, in many cases, the decision-making is automated to support real-time responses. So I hope I was able to give you the basic understanding of what is business analytics. However, if you like what you read and would like to pursue a career in business analytics or get to know the tools that are required in BA, head over to our course. It is a course designed to give you understand of the most used tools in BA.